You must have already downloaded and installed Polyphemus to have this test case working. This test-case is up-to-date with the version 1.8.1 of Polyphemus. Below, [version] will stand for the version number you are using. Note that a more complete and detailed version of this documentation is available in Polyphemus User's Guide although this should be sufficient to get the simulation running. A subdirectory config/ which holds all the configuration files used in the preprocessing and the simulation. It is the directory from which to work. puff_line/ for the Gaussian puff model with a gaseous line source. puff_aer/ for the puff model with point sources of gaseous and aerosol species. 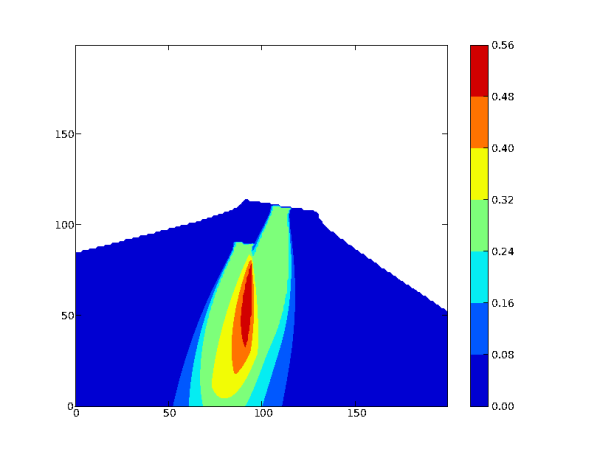 plume/ for the Gaussian plume model with gaseous species only. Prior to use Gaussian models, you need to compute scavenging coefficients and deposition velocities for the various species. 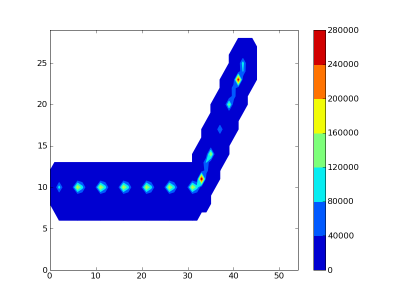 This is achieved by using gaussian-deposition_aer. You can use make instead of scons to compile all programs. Computation of the scavenging coefficients... done. Computation of the deposition velocities..done. The file gaussian-meteo_aer.dat has been created in the directory TestCase/config/. The file puff-discretized.dat has been created in the directory TestCase/config. It contains a series of puffs representing the discretized line source. Sources: 2 point sources for Iodine, one point source for Caesium. Meteorological situations: 4 situations, rotating wind with an increasing speed (0.1m/s, 2m/s, 5m/s et 10m/s). 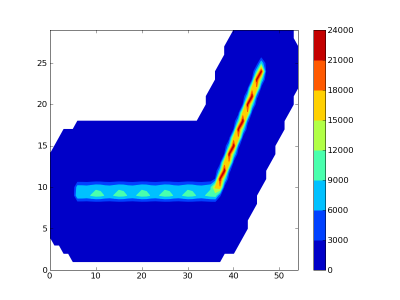 plume.cfg gives the simulation domain, the options and the paths to the other files. gaussian-levels.dat gives the vertical levels. gaussian-species_aer.dat gives the species data (species names and radioactive half-lives are used here). meteo.dat gives all meteorological data. It does not contain scavenging coefficients or deposition velocities since the simulation will not take these processes into account. Therefore, it was not necessary to use the preprocessing program gaussian-deposition to create this file. plume-source.dat contains all the data on stationary sources. plume-saver.cfg contains the options and paths to save the results. Sources: 1 point source per species. Meteorological situations: same 4 situations. 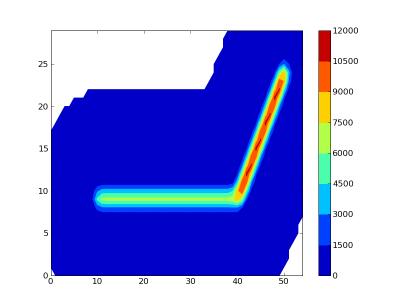 puff_aer.cfg gives the simulation domain, the options and the paths to the other files. gaussian-species_aer.dat gives the species data (only species names are used, since all other data have been used during preprocessing). gaussian-meteo_aer.dat gives all meteorological data and scavenging and deposition coefficients. It was created during preprocessing. puff-source_aer.dat contains all the data on gaseous and aerosol sources. puff-saver_aer.cfg contains the options and paths to save the results. 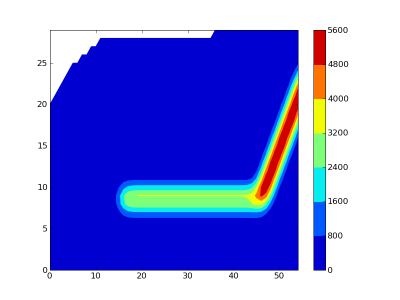 puff.cfg gives the simulation domain, the options and the paths to the other files. meteo.dat gives all meteorological data. Loss processes are not taken into account so there is no need to have scavenging coefficients or deposition velocities. puff-source-discretized.dat gives data on the discretized source. It has been created using program discretization. puff-saver.cfg contains the options and paths to save the results. 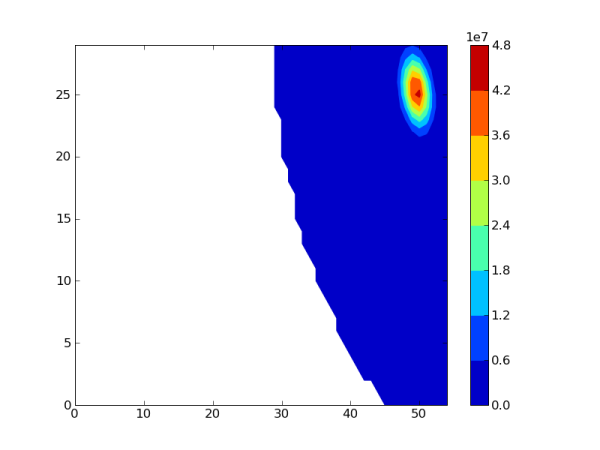 To visualize the results of a simulation, use the interactive python interpreter IPython. Previously, you should have put the path to Polyphemus-[version]/include in your PYTHONPATH. For instance, for Bash users add export PYTHONPATH=$PYTHONPATH:~/Polyphemus-[version]/include to your .bashrc. By doing that you ensure that you do not have to import atmopy again. However, when quitting ipython, you will be back in the directory from where it was launched. To visualize several time steps on the same figure, just use contourf several times. If you want to clear the figure, use the command clf(). Figure below gives an example of what you can obtain. TestCase-1.1-Gaussian.tar.bz2 for Polyphemus-1.1 and 1.1.1. TestCase-1.0-Gaussian.tar.bz2 for Polyphemus-1.0 and 1.0.1.